For many students, the winter term Reading Week offers the chance to catch up on assignments or hang out with friends. But for a group of students in Wilfrid Laurier University’s Faculty of Music, the recent Reading Week was anything but relaxing. From Feb. 19-23, the group was in crunch mode behind closed doors of the Theatre Auditorium to put the finishing touches on their capstone course project – Opera Laurier’s production of Aaron Copland’s The Tender Land, which opens Friday, March 2 at 8 p.m.
Each academic year, voice students in MU298: Introduction to Opera, MU398 and MU498: The Practice of Opera, parts I and II, stage two productions – an evening of operatic excerpts around a unifying theme in the fall term and a full production with orchestra in the winter term. The courses were designed by Leslie De’Ath, professor of piano and music director, and Kimberly Barber, associate professor of voice, the Faculty of Music’s associate dean: external and Laurier’s opera program coordinator. They offers students hands-on experiences to learn about and practice stagecraft, stage makeup and costuming, and all aspects of production from the physical set to stage management, publicity and marketing. The courses also challenge students to be creative and resourceful during the production phase – time is limited by the academic calendar and set design, costuming, and lighting are governed by a tight budget. But the limitations are what seem to inspire students the most, says Barber. Opera production is an experience many music faculties reserve for graduate students. Participating in Laurier’s three undergraduate opera courses gives music students an edge for graduate school applications and future career pursuits. It’s why River Guard (BMus ’17), a student in Music’s post-graduate opera diploma program, is participating in Opera Laurier for the fourth time. Guard participated twice as an undergraduate student, once as a student volunteer, and now as a graduate student building his performance resume. During his first Opera Laurier performance, Guard was asked to fill in at the last minute for a classmate who became too ill to perform. Guard took on the two mid-sized roles in L'enfant et les sortilèges in addition to his own role in Gianni Schicchi during the year-end double bill. Guard will perform the role of Martin, the hired hand in The Tender Land, but stresses the importance of all roles required to make any performance come to life. Guard and classmates performed in November 2017 under the direction of Laurier opera alumna Amanda Smith (BMus ’11), who co-directed the 2015 Opera Laurier excerpts production and has subsequently directed every Opera Laurier excerpts production since. Smith is the founding artistic director and resident stage director for Fawn Chamber Creative, a performance collective in Toronto, working alongside music alumni Darren Creech (BMus ‘12). Her previous experience as a student in Laurier’s opera courses, combined with her professional know-how, has been instrumental in the students’ preparation for the show’s opening on March 2. Barber, De’Ath and returning Opera Laurier director Anna Theodosakis selected The Tender Land for the year-end production for its technical appropriateness to young singers’ voices. Copland’s opera also offers a story line centred on finding love, wondering what the future holds, and perhaps most importantly, finding one’s voice – big themes that student performers and audiences can relate to. The Tender Land opens Friday, March 2 at 8 p.m. in the Theatre Auditorium on Laurier’s Waterloo campus. 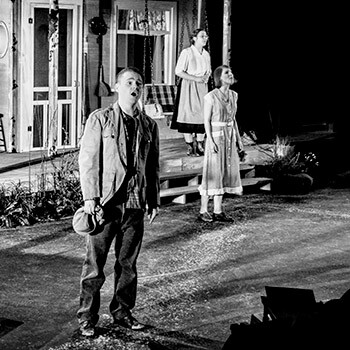 Additional shows are scheduled for Saturday, March 3 at 8 p.m. and Sunday, March 4 at 3 p.m.
Tickets to The Tender Land are free for Laurier students and high school and elementary students, $20 general admission and $10 for seniors, non-Laurier university students and college students. Tickets can be purchased at the door before each performance, or in advance by emailing concerts@wlu.ca or calling 519.884.1970 x2432. Tickets are also available online through ticketscene.ca.